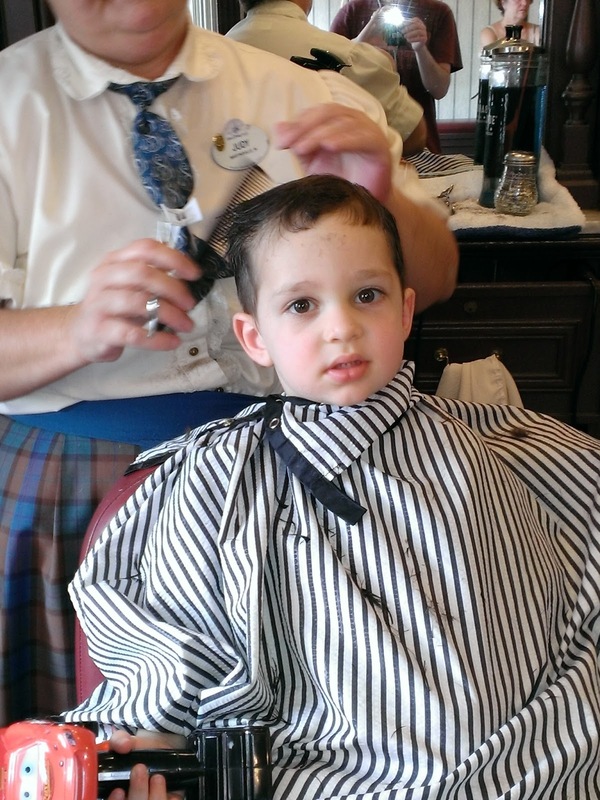 My littlest man needed a haircut from, well pretty much from Day 1. That's a lot of hair for a newborn! But, I loved it and refused to touch it. We had his first Walt Disney World trip planned... well, probably before he was born. We knew we were going to runDisney at some point in time in 2013 and decided on the 2013 Princess Half Marathon early in 2012. I knew that Z would follow in his brother's footsteps and have his first haircut at The Harmony Barbershop. After 3 fantastic experiences, I knew we would have a great time. Not sure what time we would arrive at the Magic Kingdom, I made a late day reservation, but decided to check in earlier when we arrived. We were told 45 minutes, so went to walk around Town Square. We were back in probably 20 minute to wait, and after a lot of waiting, I finally asked how many people until our turn. Next to the boys' names was our original time and we had just completely been skipped! Apparently, the cast members checking in people had switched and the new one had no idea what was going on. There were several families that had been shuffled around - 1 had 2 people getting cuts had 1 in a chair when they were trying to get a different family checked in. The parent wasn't having that (obviously, since 1 was already in a chair, they were first), she put her son in the chair and made sure she was next. I was told that since my reservation was for later that I wouldn't be seen early, to which I explained that I had checked in 45 minutes ago and was told I would simply go in order - when they wrote down my time, it just confused everyone. Had I realized that coming in early, obviously we wouldn't have done it, but the first check in person said "no problem!" They fixed the order situation and Noah and Z were sitting in their chairs waiting for their haircuts. 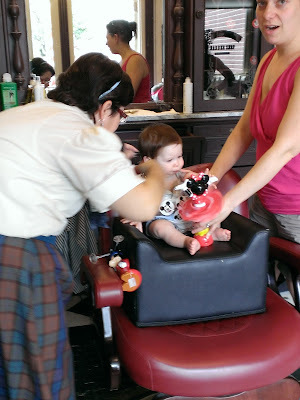 I stood holding Z while he played with the twirling Minnie and tried to get all of the Mickey Mouse stickers off of him. Adam hung out with Noah while he got his haircut. 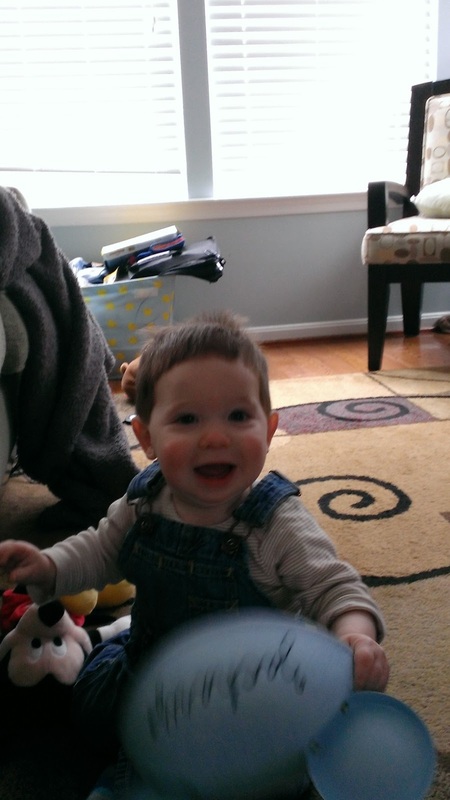 Noah's hair cut was good - just as we always get it done. Well, Z left needing a haircut. His hair barely come above his ears and was so long in the back it practically made a rat tale. And, then the worst thing happened - I tried to fix it with scissors! Since our trip and almost exactly 1 month since his first haircut, he's had a 2nd professional haircut. And, now he looks like a beautiful little boy! 3 out of 4 great experiences isn't bad... but, now I'm not sure if it will be a "must-do" every time now!